, of Sienna, was born in that city in 1347, and having vowed virginity at eight years old, she took the Dominican habit some time after, and became eminent for her genius, charity, zeal, and writings. Going to Avignon, in order to reconcile the Florentines with Gregory XI. who had excommunicated them, she pressed that pope so much, by her discourses and solicitations, that she engaged him to quit France and go to Rome in 1377, where he again fixed the pontifical seat, seventy years after Clement V. had removed it to France. She died 1380, aged 33, and was canonized by Pius II. 1461. Various “Letters” in Italian are ascribed to her, which were printed at Venice, 1500, fol. 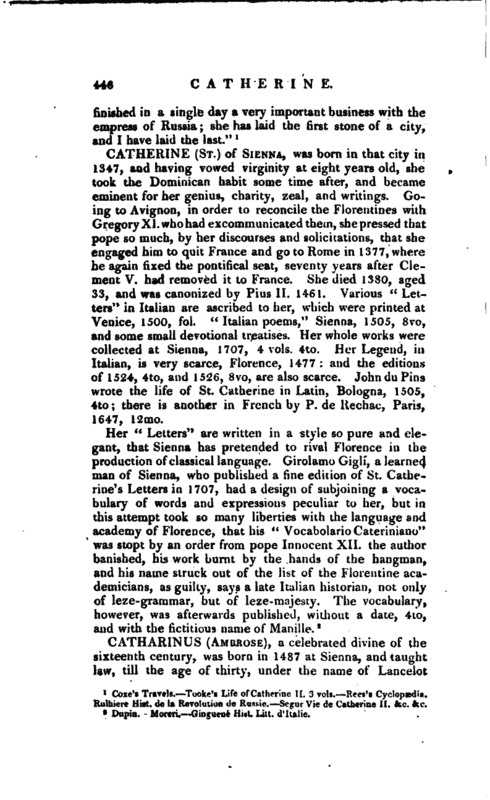 “Italian poems,” Sienna, 1505, 8vo, and some small devotional treatises. Her whole works were collected at Sienna, 1707, 4 vols. 4to. Her Legend, in Italian, is very scarce, Florence, 1477: and the editions of 1524, 4to, and 1526, 8vo, are also scarce. Johndu Pins wrote the life of St. Catherine in Latin, Bologna, 1505, 4to; there is another in French by P. de Rechac, Paris, 1647, 12mo. Dupin. —Moreri.—Ginguené Hist. Litt. d’Italie.